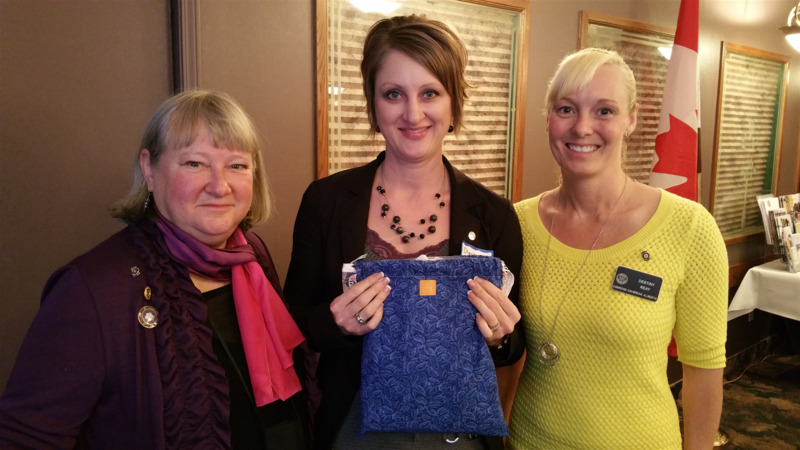 Charissa Cummings of Red Deer spoke to our club about the delivery she and nine others made - a very special delivery. These ten women packed their checked luggage with 500 Days for Girls kits and headed to Guatemala this past October. Through an interpreter, these women brought education on reproductive and women's health, debunked some prevalent myths and ensured that all the girls in the school, as well as their mothers, had access to sustainable hygiene through a beautiful kit sewn with love by many Canadian volunteers. The girls and women were very receptive to the education and thankful to receive their kits. Charissa, a former Rotarian, has travelled to Guatemala many times and has service connections there, particularly with Impact Ministries School and its associated projects. She is working on laying the groundwork for setting up a sewing project there to train local girls and women to sew kits and educate the women in the villages, where access to feminine hygiene products is non-existent. We look forward to staying in touch with Charissa as she continues to improve conditions for girls and women in Guatemala.